What you have there is actually called a Mill's Atkins Front slot machine! What type of history are you looking for as I am sure many people here on the Forum can answer your questions! More pictures of the slot machine as well as the internal mechanism would establish the "history" of the slot machine as well! It is most likely a reproduction akins front . I make this assumption due to the fact the pull handle is a bit longer than it should be , it is 25 cent 25 cent aitkens front are much more scarce then the 5 cent or 10 cent model , also the finish on your machine looks relatively new . Single cherry payoutvmay also be improper for the machine .This is not to say that it hasn’t been restored at some point . The tell tale sign will be the width of your front casting . The original Aitkens front will be a 1/4” wider the the replica machine . I may have an exact dimension buried somewhere in my computers data but it may take some rooting outto find it . The vast majority of the aitkens are reproduction machines . I'm not sure what pictures to upload, but here are a few. There are serial numbers on the reel mechanism and in other places. I would like to find out more about the machine. If anyone has manuals, maintenance suggestions, etc. The machine has been in the family for 20+ years, but likely a reproduction. In the past people have used nickels instead of quarters. The machine will still spin, but jams as the nickel goes down the top window. I can see that there are devices that should allow the nickel to fall into a hopper, but it doesn't work properly. That is my assumption anyways. Any advice? The Mills Aitkens front came out in 1946. It was also known as the Fancy Front and the Extra Bell. In order to respond to your inquiry I need to first give you a little backstory. The unique thing about most (but not all) Mills machines is, from the 1930s to the 19050s, the wooden cases and mechanisms were identical. Al that changed were the design of the metal castings on the front. You could swap the castings from a 1930s roman head with the castings from a 1950s high top and they would work the same. 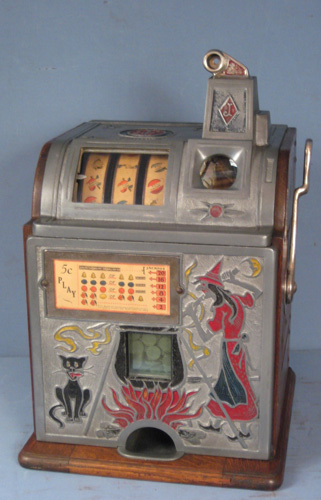 Around 1976, California legalized the possession of antique slot machines. In the years that followed, demand for antique slots was such that their retail price increased 100% per year. 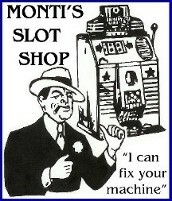 Sensing there was money to be made, in 1978, an individual in Reno, Nevada spent $4 Million in 1978 dollars buying up every antique slot machine and slot related item he could purchase throughout the United States and in Japan, where Sega had copied Mills machines and placed them in throughout Asia where gambling was legal. In the process, he acquired the molds for producing the upper and lower castings for the Aitkens Front, the High Top and other Mills machines. Because manufacturing slot machines was legal in Nevada, he began turning out new, "antique" Mills machines using the original molds. All of a sudden the market was flooded with these "new antiques" and you couldn't tell the difference between a new antique and a restored original. Just by the sheer numbers that were produced, more than likely you have one of the "new antiques." There is no way to tell because the castings came out of the original Mills mold. Because just about any Mills mechanism will work in just about any Mills machine, again, it is impossible to tell if yours is an original Aitkens front with the original mechanism, or another mechanism slapped in a new antique case. Your machine, as a new antique, routinely sold for $1,800 when they started knocking them out. In any case, take comfort in knowing that of all the gambling games and devices ever invented, only one is uniquely of American (and California) Origin - the slot machine. You are helping preserve a part of America's gambling heritage. As a side note, the first slot machine was invented in 1895, in San Francisco, by a Bavarian Immigrant named Charles Fey. It was more like a giant wheel of fortune. Four years later Fey came out with a three reel slot machine like you have now. Back then, the law did not allow for patents on gambling devices, so he did not sell his machines for fear someone would reverse engineer them and go into competition with him. Instead, he placed them in bars and taverns around San Francisco and kept the only key. Once a week he came around, opened the machine, gave half the winnings to the house and kept half the winnings for himself. When San Francisco suffered the great earthquake in 1906, Fey hitched up his mule to a wagon and went from bar to bar to collect his machines from the rubble. He recovered what was left of all oif them except for one, which was missing from a bar on Market street. On the one year anniversary of the earthquake, the Mills Machine Company of Oakland announced the release for sale of their slot machine. It was the exact duplicate of Fey's device. Now Fey knew what happened to his missing machine - his worst fear had come true. Someone took it Mills, who reverse engineered it, made their own machines and were now in competition. That's how Mills got its start.